With over 17 years’ experience, Julie joined Heineken Ireland in 2013 from a highly successful stint in London, where she held senior global and UK positions at Diageo and Marks & Spencer. Before her appointment with Heineken Ireland, she was Head of Brand and Marketing for General Merchandise at Marks & Spencer UK in London, a move which represented a departure from Julie’s prolific drinks industry marketing career working in various roles with Global drinks giant Diageo, including Global Marketing Manager for Baileys, where she was responsible for emerging market growth across China, West Africa and Brazil, and Head of Baileys UK. 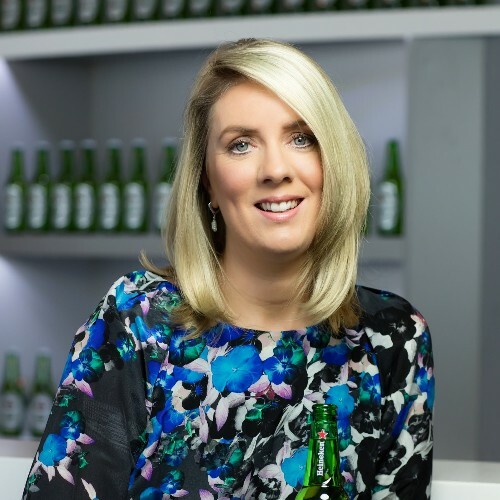 On Julie’s return to Dublin, she joined the Heineken Ireland team as head of the Heineken brand. In her role, Julie lead the brand strategy and operations planning and oversaw the planning and implementation of their sponsorship programmes including Heineken Cup, UEFA Champions league and an extensive programme of Music sponsorship. She went on to lead the campaign development for the 2015 Rugby World Cup globally. Julie moved to Head of Ciders in 2016 and leads brand strategy for both Orchard Thieves and Appleman’s, a newly launched cider brand in 2018. An Agency-Client double act, Julie Wells will be joined by Kay McCarthy, Founder & Managing Director, MCCP, to share some of the learnings in creating a strategy to not just create a brand but one that transforms business.